100 days ago Flipnote Studio was released in the Americas region, so this is a special day for us. We'd like to thank all of our users from around the world for posting so many excellent Flipnotes and helping us to build this international online community. We couldn't have done it without all of your help, and we'll continue to try our best to make the next 100 days even better. This week we made some improvements to Flipnote Hatena for all of our users worldwide that we hope you are all enjoying, and also the Flipnote Studio Viewer application was released in Japan that allows Nintendo DS and DS Lite users to preview all the fun that you can have with Flipnotes. In this week's edition of the Flipnote Hatena news blog, we're going to show you some of our favorite Flipnotes based on last weeks topic "Special Autumn Events", and introduce our new topic for this week which is "Surprises". If you post Flipnotes about the weekly topic, we might feature yours here on the Flipnote Hatena Weekly News blog next week -- post your Flipnotes and join in the fun! Lastly, scroll to the bottom of this blog entry to see the third week of our new section titled Weekly Frog Sightings where we want to feature original frog photos from users like you. 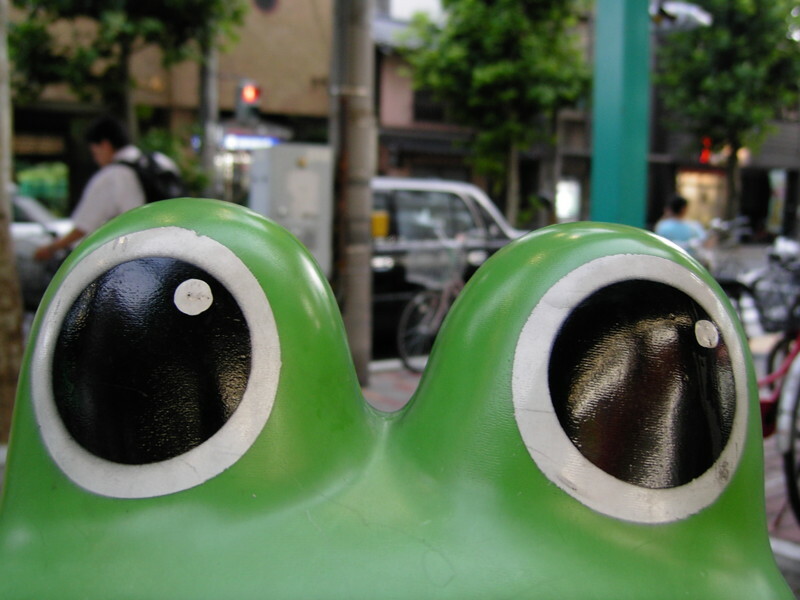 We're looking forward to seeing your original photos of frog related stuff from around the world, so please post yours on Hatena Haiku (post to the keyword "Frog Sightings") and we might feature it here next week. Thanks to the help of Dr. Zoom and MdM you can also read a translation of this blog in German or Italian. Please be sure to check out the translations of the blog and give them some stars for all of their hard work. If you are interested in helping us translate the blog to French or Spanish please get in touch with us. Please note that this is a volunteer position, but your work will be very much appreciated by all of us at Hatena and the Flipnote Hatena community. Also please let us know any feedback you might have about our blog by posting your comments in the box at the bottom of this blog entry. The best of last week's topic: "Special Autumn Events"
As of today, there were 707 Flipnotes posted by users from around the world for last week's topic and we've done our best to introduce some of the best of those Flipnotes which we hope you'll enjoy. You can also see the Flipnotes for last week's topic posted from your own region by entering the command via "Command Search" from Flipnote Hatena on your Nintendo DSi. ★ The spirit of the autumn in many parts of to world is nicely illustrated in "Pile of Leaves" by n00b™ (id:CleverMind). Watch this in loop mode to experience endless autumn fun. Thanks for posting, and nice work! ★ We really enjoyed the original music and cast funny characters in "Autumn Jam" by FunnyOrDie (id:EP_Shadow), who has posted a large collection Flipnotes that are sure to make you laugh. ★ Helium (id:galliummoon) has made another excellent submission for this week's topic titled "Tree in Autumn" that tells the story of the changes in the life of a tree during the months of autumn. ★ We liked the smooth animation and excellent drawing in "Conker Fight" by Jackton (id:Jackton), and would like to try it out ourselves too sometime. For those of you who don't know what a conker is, they are also known as horse-chestnuts and there is a Wikipedia page all about them. Great work, Jackton, and thank you for again submitting a Flipnote about the weekly topic. ★ Hinto (id:Hinto) is back again with a strange and funny Flipnote for this week's topic titled "Leaf Love", featuring a hat that loves to collect leaves. We really like the sounds and cute animation by this creator, which brings smiles to our faces every Friday! ★ During the autumn in Japan, many schools have festivals with all sorts of special events. This Flipnote by Jyutan (id:dokkanbeat) is a beautifully animated love story that takes place during one of these autumn school festivals. ★ Dr.Zoom (id:DrZoom), one of the leading creators in the Europe and Oceania region (who also translates this blog in to German), also posts Flipnotes with a Japanese DSi as Dr.Zoom JP (id:DrZoomJp). We enjoyed this Flipnote titled "Autumn" ("Aki") which captures the spirit of the season with beautiful animation and sound. ★ One fun part of autumn cultural festivals at schools in Japan is the food that is served. One of the most popular types of food served at festivals in Japan is called Yakisoba, which is stir-fried noodles cooked with meat and vegetables in sauce. This nicely animated Flipnote by Bouningen shows you how to make Yakisoba, if you want to try it yourself. For this week's topic we challenge you to make Flipnotes that will somehow make people feel surprised. Think of topics such as Jack in the boxes, magic tricks, trap-doors, haunted houses, and any other types of unexpected things you can think of and bring them to life in a Flipnote. Starting from this week you can post your Flipnotes based on the weekly topic directly to channel 8 on your Nintendo DSi. We're looking forward to seeing how much you can scare and surprise us, and will showcase the best Flipnotes next week right here in the Flipnote Hatena Weekly News blog. Do you have any ideas about how we can improve Flipnote Hatena? 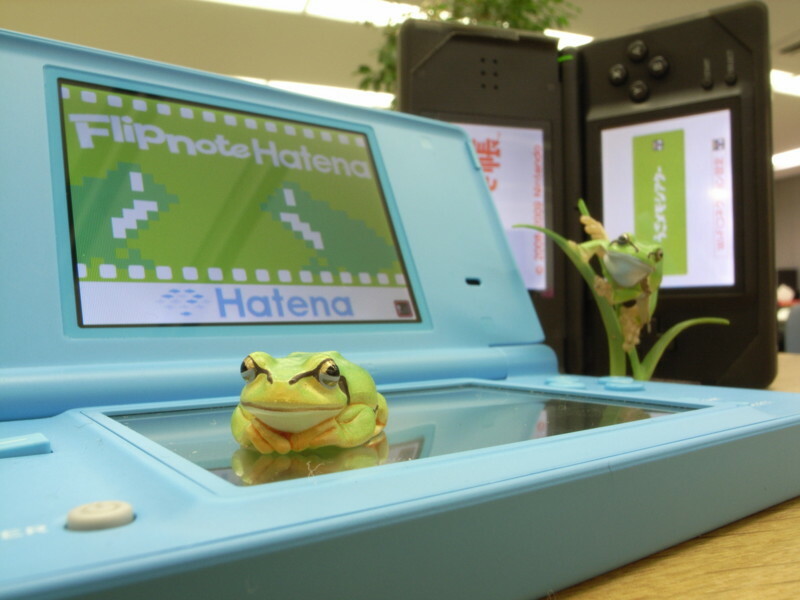 Please let us know by posting a Flipnote with your ideas to the Hatena Request Channel. You can post your ideas and feedback by entering the command to directly access the Hatena Request Channel and post your Flipnotes for us there. In front of many drug stores and pharmacies in Japan you can find all sorts of interesting characters, such as elephants, rabbits, and even frogs. Here's one of those characters, known as "Kero-chan", that we spotted here in Kyoto recently. If you are interested in having your frog photo featured in the "Weekly Frog Sighting" section of the blog you can post it on Hatena Haiku (post to the keyword "Frog Sightings") and we'll choose the best ones and feature them here. Please submit only original photos that you have taken yourself, and tell us the place and date you took the photo. Thanks for taking the time to read our blog, and please add a star if you enjoyed it! Also, please let us know what you think about the Flipnote Hatena Weekly News blog by posting any comments you might have in the box below.